A silver banner is embellished with gold stripes and star cutouts and wraps around a full color megaphone. Standing on a base with plenty of room to personalize for your event, this modern design is a unique award for excellent performance in cheer. The bold rising star banner at the top of this shield design resin broadcasts that you are presenting the award for excellence in cheer. The textured background features a 3 dimensional cheer scene, and the resin is mounted on a black base with plenty of room to personalize for your event. Available in two sizes, this modern resin award will be a big hit! This full color resin features an oval swirl of silver and gold shooting stars orbiting a megaphone and pompoms giving this piece a sense of motion. Add a personalized plate for your event for a modern, budget friendly cheer award that is out of this world. Black, gold and silver flames rise up around a cheerleader igniting the crowd. Just add a personalized plate to this modern award design and its ready to recognize those who personify spirit. Acknowledge the star performers on your team with this sleek, modern resin design. The gold and black perpetual stars serve as a back drop for a full color megaphone. Attached to a black base that has plenty of room too add a personalized plate, the Infinity Star is an award that fits any budget. 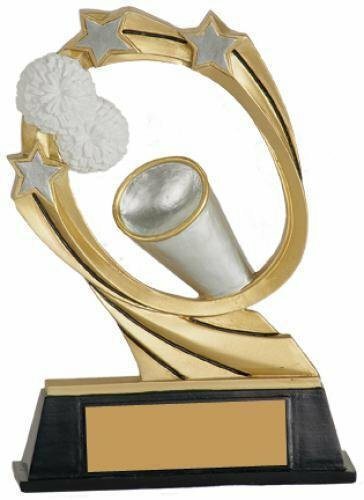 The star on this cheer award is leading the victory dance to celebrate a top notch performance in cheer. 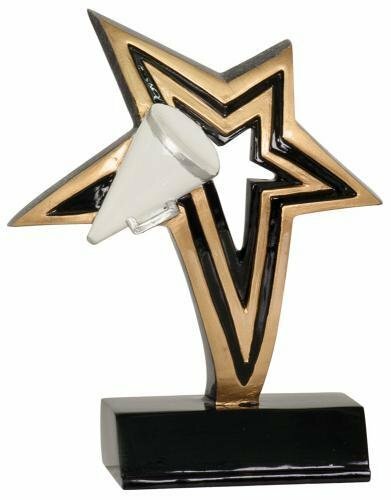 Just add a plate to the base to personalize it for your star performers and this award is ready for your event or awards ceremony.